AN OIL spill in the Gulf of Mexico has been continuously flowing into the sea for more than 10 years after a hurricane - however the amount that has been leaking was grossly understated. An investigation by The Associated Press found evidence showing that the spill is much worse than the authorities and company who owns the site initially believed. A mudslide caused by Hurricane Ivan knocked down an oil platform owned by Taylor Energy Company off the coast of Louisiana in 2004. Blocking the 28 underwater wells - that are covered in sediment - from leaking anymore fuel has proved difficult. The New Orleans-based firm said that only four gallons (15 litres) of oil was lost each day. However, a fresh estimate provided to AP shows that the leak totals about 20 times the number claimed by the company. 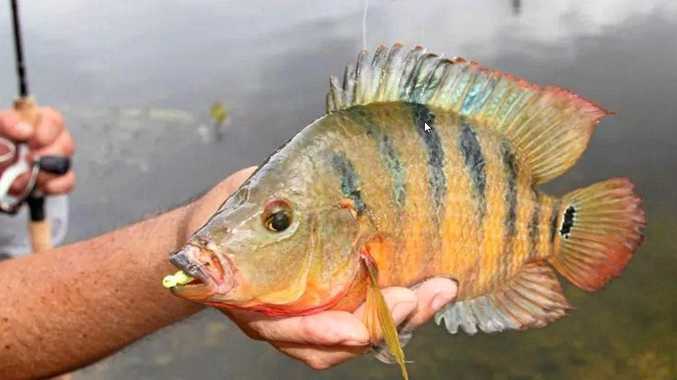 This can only spell disaster for the many wildlife reserves and conservation areas around the Louisiana coast, especially as it has coincided with the 2010 BP oil spill in the Gulf of Mexico. A report by the US government states that 4.9 million barrels of oil belonging to BP had polluted the sea. 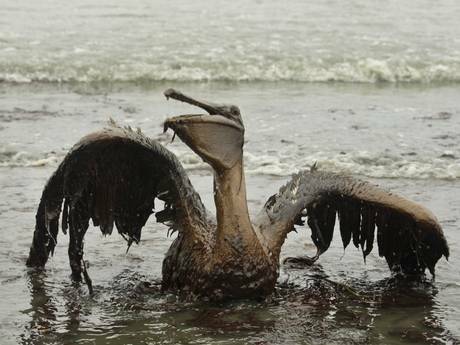 A pelican struggling with being covered in oil from the BP spill Endangered animals have particularly been at risk. The number of nests inhabited by Kemp's Ridley sea turtles dropped by 40 per cent in the year of the BP oil spill. "We had never seen a drop that dramatic in one year before," according to Selina Saville Heppell, a professor at Oregon State University. The population of the turtles climbed in 2011 and the subsequent year but then started falling again in 2012. The number is down to the lowest in nearly a decade, she added. 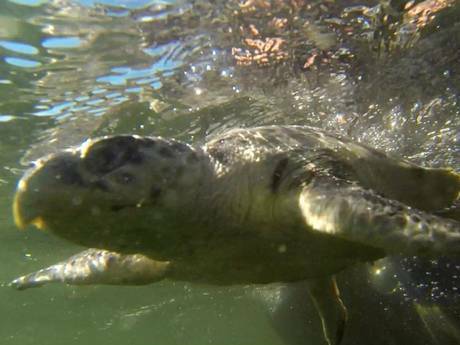 A rehabilitated Kemp's Ridley turtle as it is released into the sea Florida Democrat Senator Bill Nelson wrote in a statement to say that the situation is "unacceptable". "If you've got an oil rig that's been leaking for 11 years, then it's time for us to find out what's going on," Nelson said during a telephone interview, according to AP. Taylor Energy Company sold its assets in 2008 and has ceased drilling and production operations - as stated on the firm's website. The founder, Patrick Taylor, died in 2004.